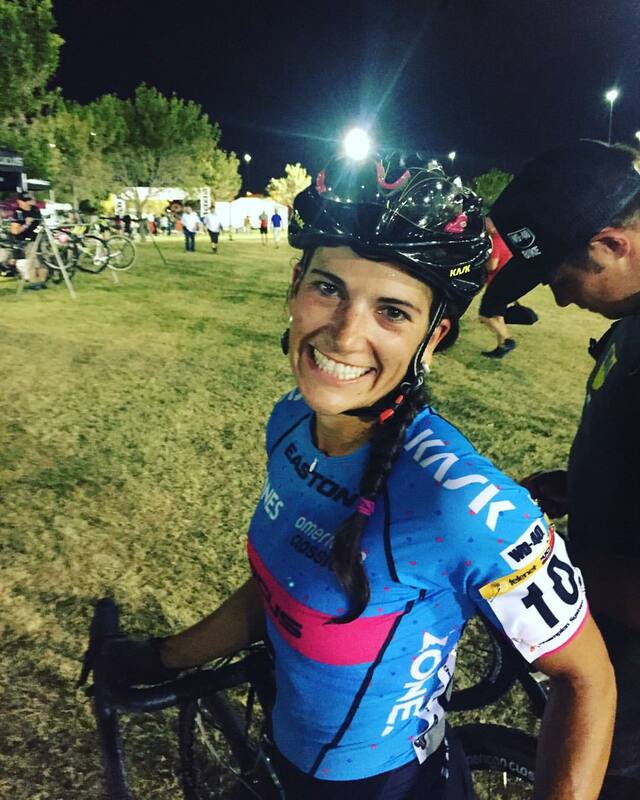 I’m Courtenay McFadden, I race cyclocross at the Elite/Professional level all over the country and in Europe as well. When I’m not training, traveling, or racing I’m usually at home spending time with my husband and my kitty Nugget. I live in Bellingham, WA out of the Pacific Northwest, and I couldn’t be more proud of where I’m from! My next love after biking, includes the human body. I have both my BS and MS in Exercise Science, and until last summer worked as a Personal Trainer. I decided to take some time off to focus on racing, myself, and have surgery at the end of the 2016/2017 cyclocross season. I know I’ll go back to working as a trainer, as I love watching my clients improve their life through exercise, and I love working and watching the magic of the human body. It’s absolutely amazing what it can do. Even though biking is my all-time favorite outdoor activity, I enjoy running (short distances), hiking, any fun water activity in the summer, and yoga. Tell us about your #bikelife, what inspired it? I got into riding my senior year of college. Prior to riding bikes I was an avid runner, and a pretty bad one at that! I don’t think I’m built to be a speedy amazing runner, so I’m pretty glad I found the bike. I’ve always been active my entire life, I grew up playing soccer, dabbled in lacrosse, and loved riding my bike growing up. When I was 12 years old it was a beautiful day and I decided I wanted to go for a bike ride. I was having a fantastic time, but upon heading home crossing a busy road (walking my bike through a crosswalk as we were taught to do) I was hit by a car. There was more mental trauma to this event than physical trauma, as the car actually hit the bike and not me, but I was thrown to the ground when it happened. After this day I had no interest in riding a bike ever again, until I was 22. It was my senior year of college and I had been teaching spin classes at a local gym for 3 years (plus other group fitness classes). I had been very interested in getting a road bike as an alternative to running, because running was really starting to hurt my feet and knees. Being a college kid, I had no money, so it was just a dream. A couple of the members of the gym I was teaching at (still do!) pitched in and bought me my first road bike. It was great, I liked it, but it was way harder than I thought it was going to be, and my motivation to riding in the rain was pretty minimal, which meant since I live in the PNW, my riding my bike was minimal was well. At the time I was still enjoying my college years and being 21 years old, so riding wasn’t really a priority, I just did it when I wanted some exercise. I tried road racing that spring with the collegiate team (how I met my husband), and strongly disliked it. I graduated college winter of 2007, and didn’t really ride my bike after that. It wasn’t until summer of 2008 that I started putting more time on the bike, and went back to for my masters that Fall. Since I’m not one to give up, I decided I should try racing one more time, I had been riding more and was enjoying it more than I previously had. I joined the collegiate team and did the collegiate road racing season in 2009. From there it’s history. Cyclocross is by far my favorite! I don’t think there is one event that I love more than the other. There’s something sooo amazing about racing cross. The community, how it’s like nothing else you can do on a bike. 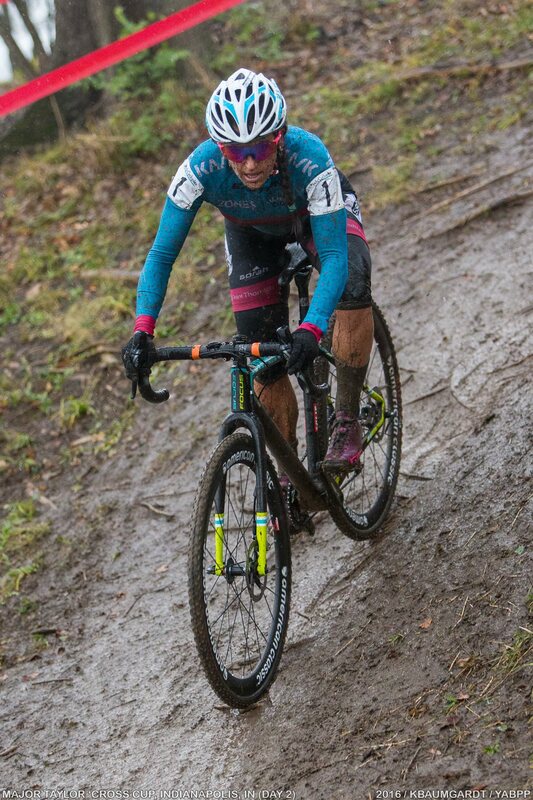 You can mimic both road racing and mountain bike racing, but you just can’t mimic cross, you really only have the cross season to soak it up. 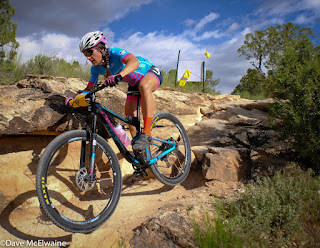 Last Spring I did some of the Epic Rides events (Grand Junction and Carson City) and I was (still am) extremely impressed with the level of those races, the competition, the courses, the weekend of organization, is top notch. The equal payouts for men and women is also wonderful. I love competing, I think because I’m competitive! Although, I’m really most competitive with myself. I found myself getting stronger and stronger on the bike every year I was riding, that I just kept wanting to get better and see how much better and how much stronger I could get. It was like this game with myself, it’s changed a little bit as I’ve become result focused I’ve learned that I need to tap into some competitiveness with those around me and ACTUALLY race my bike! This year was a really good year for me to remember that we don’t just ride hard in circles, that there are other people you are racing against and racing isn’t just about laying out the power, but also being smart about when you lay out the power, and of course off road racing you need the technical abilities as well. What advice or tips would you give to someone who is nervous with participating in their first cycling event? I would tell them there is nothing to be nervous about. I think some of what I love about cycling is the community. Everyone is here to lift each other up, we want more people on bikes so we aren’t going to make it a scary scene for new people to join. Sometimes I think that racers get big ego’s, especially around those that don’t race, but I always remind people, you were that person once too, don’t be rude, be welcoming and teach and share your knowledge. Can you take us back to your first few mountain bike rides? What did you learn from those experiences? Technically my first time on single track was on my CX bike and I was TERRIFIED (of going downhill). I ride those trails on my mountain bike now, and given they are the XC easy trails on our local mountain, but not really fun on an entry level cross bike with brakes that don’t work (also..I don’t miss canti brakes)! I vividly remember my first mountain bike ride. My (now) husband helped me purchase the mountain bike the summer after my first cross bike. It was a 26in hardtail Norco Fireball. It was a good bike to learn on. It took a lot of beatings and it kept trucking! He took me on a very short loop up to this trail called SST and I was scared the entire way down. I got off my bike multiple times, there might have been some cursing and yelling his way. I swear the trail was steeper then, than it is now! Those experiences taught me that entry level cross bike brakes are terrible for single track descending and to never give up. It took me a long time to ever want to ride SST again, or any trail marked with a black diamond, and that I should ride my mountain bike with girlfriends before riding it with my boyfriend. Girls know the good trails to ride that aren’t scary, they aren’t trying to kill you, and it’s always easier to learn from your friend than your significant other. What inspired you to keep with it? When I got my mountain bike in 2010, at that point, I loved riding. It was nice to have another modality to ride for a change of scene. Mountain biking had a lot more casualness and fun around it versus road riding. Also, because I’m not one to give up on things, I wanted to master it. Every ride was like a puzzle, how am I going to get through, over or around this obstacle? I remember going for a ride and being so frustrated because I didn’t know how to get over larger roots, so I would get off and walk over it. I went back and told my roommate how annoying it was to get off my bike, and she told me “Oh you just need to lift your front wheel, this how you do it, I’ve been working on it too.” it clicked instantly and my ability to ride my mountain changed forever! There are still things to this day that I haven’t conquered, and that’s what I love about the sport. You can always keep pushing yourself to become better. Oh boy that’s easy! I’m an XC rider, so def clips! Clips…because that’s what I learned on. I have ridden on flats (at the dirt jump park) and it’s scary. I do think there is a place for flats and they are good to learn body position on the bike and how you need to distribute your weight, what to do with your feet to help you maneuver the bike. I would like to practice a little more with flats, even though I find them scary. I haven’t had any crazy scary emotional crash that has left me scared. I have my fair share of crashes, that’s for sure! I have absolutely crashed on stuff that when I get to it in a trail I get a little nervous trying it again or I wait it out until my confidence has built back up again. A couple years ago I had my friend from Seattle come mountain biking with me in Bellingham. I took her to a pretty techy trail, and she was walking a lot of the stuff I was riding. I vividly remember her asking “how did you get so good”, and I said you just try it and don’t be afraid to crash. Of course, after this I crashed on some steep part of the trail, but told her you can’t be afraid to try it out, it’s the only way to know your limits and improve. Typically, in a ride after 1 or 2 crashes I am little more timid, or some days I’m just not as open to crashing as others and I’ll play it more safe. I think the biggest thing is, you can’t be afraid to crash. The best riders in the world crash, it’s a part of the sport, take it in strides, and remember to relax, the more stiff you are when you crash, the more it’s going to hurt! I’m still working on being a better turner. I know that sounds somewhat ridiculous considering there’s a lot of turning in cycloross, but it’s such an easy way to make up and gain time. In mountain biking switchbacks were SOOO hard. The main trail to access our mountain is a series of switchbacks up (and down if you go down that trail). I could make it up, but down was so hard. I would purposely take that trail down so I could work on my switchbacks. I’m still not amazing at them, but I’m working to be better, faster, and smoother! Learning the front wheel lift changed my life! Once I learned how to do that, my riding and my enjoyment of riding increased dramatically. Not really sure on the best tips, I wish I had taken a clinic when I first started mountain biking. I think I would have learned a lot and also not picked up the bad habits I’m trying to lose now. 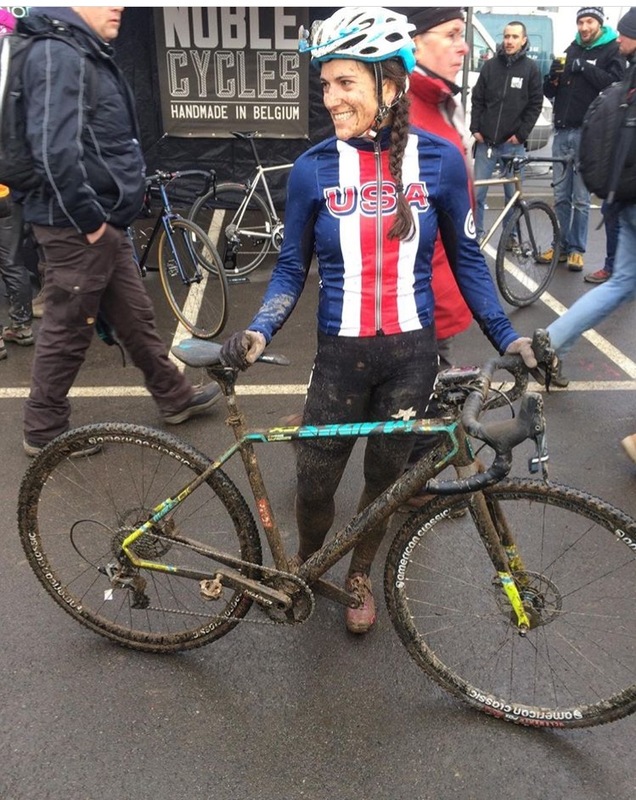 What do you find the most challenging about cyclocross? What suggestions/tips can you give for someone who is interested in trying it? I believe the most challenging thing about cyclocross for me is the intensity. You’re pushing your limits the ENTIRE race, and not only physically, also mentally, you need to be able to handle your bike and be confident with it when you’re nearly in the red zone. What would you say is the most challenging part about setting up your own program for racing? Time and energy. It takes a lot of focus and a lot of time, but honestly I really enjoy it. It’s challenged me to step outside of my comfort zone and ask people for things, which I’m so bad at. It’s taught me a lot about marketing, because ultimately I’m a product that I need to market, but also how I can market my sponsors product. It teaches me about proper communication, keeping people in the know and being friendly, smiley and positive. I’ve learned more than I possibly could have imagined by running my own program. I honestly didn’t know how long I would do it, since when I first started it, it was because there weren’t any pro-team prospects, so I knew if I wanted to race I had to take matters into my own hands. I was hoping that I would do it just 1 year and then jump on a team, but after a year of running my own thing I felt this huge connection to my sponsors and I didn’t really want to drop that, and now, I’ve really built something for myself. What has been the most rewarding aspect of your career so far? The people. Absolutely, and how much it’s taught me about…me. As I said before, not only have I stepped outside of my comfort zone in asking people for help, sponsorships, etc, I’ve traveled to Europe…alone! For someone that is terrified of traveling because of irrational fears of being kidnapped, I think that’s pretty big to take matters in my own hands and travel to Belgium, alone, more than once! Given, I was staying with friends, but I figured out how to rent the car on my own, how to drive in an unknown country, how to navigate the races. That was such a big growth for me personally, it taught me that I can truly do anything, and I don’t have to let my anxiety get in the way. I pushed my boundaries, it was hard and I cried, but I did it. Tell us about your introduction to the cyclocross world, how were you inspired? 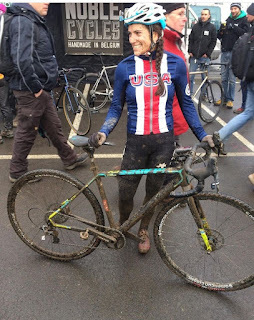 My husband introduced me to cyclocross in that I watched him race and then a couple of years later I decided I wanted to race. He didn’t actually teach me anything about it. I learned from my friends boyfriend the night before my first race. My friend and I were living together at the time, and so we went to the park across the street and he gave us a 10-minute lesson on how to dismount, remount and jump over barriers. That’s literally how I learned my cyclocross skills…hence I picked up some bad habits that a couple of years later I worked REALLY hard to get rid of (like the double hop remount). In all seriousness though, I think it’s hard to learn a new skill from a significant other, and I think the best thing for both parties involved, is to learn from someone other than your significant other! Less arguments more love. What do you enjoy most about being able to ride with your partner? I love that it’s a simple way for us to spend time together, and when I need to go out for a training ride we can go together, and he doesn’t get mad thinking I’m not spending time with him. Plus, it gives him motivation to keep riding to make sure he stays faster than me and fit! He’s also a great adventure buddy when on vacation and we’re out finding new places to ride. I absolutely love riding my bike, everything about it. I love that it takes you to places you wouldn’t ever imagine going. I love an all day adventure out on my mountain bike with friends climbing to the highest places and seeing the amazing views that riding can take you to. I love the healthy social aspect of riding. I love that it takes me outside on the nicest and worst of days. I love everything about it! Oh boy. I have a slew of them. Road Bike: Pinarello FP3. I love this bike! It’s my second road bike and was my first carbon bike! I bought it in 2010, so I realize it’s a little outdated, but it’s so comfy, I love the way it rides, so I don’t really feel a need to replace it. I bought it when I was in the market for a road bike upgrade, and wanted a carbon frame, I saw it and immediately fell in love, it’s pink, white and black. I loved the way it rode and of course loved the color scheme, so I bought it. Mountain Bikes: I have 2. I have a Transition Scout, which is 140mm Front and 130mm Rear travel at 27.5 wheel size. I love this bike, it’s not particularly light, but pedals well uphill, plus it’s SO MUCH FUN to go downhill with, plus it’s super playful and inspires a lot of confidence on the descents. Once I got this bike it really changed my riding style for the better. I bought it because I wanted a fun bike, and this is my fun bike! My other mountain bike is a Liv Lust XC full suspension mountain bike. I bought this last summer when I wanted to do some XC racing, and knew I wanted a full suspension. I chose this particular one because I think Liv is doing awesome things for women and their bikes. Plus I knew people who had it and loved it, so you can’t go wrong with that. Also being a small person it’s hard to find bikes that fit well. Hardtails (while light) trash my back (because my hip was/is so unstable from it’s issues), so my back would take a big beating on a hardtail, and the weight saving isn’t worth the uncomfortable back! I love this bike as well, it climbs really well, turns well and can handle the gnarliest of trails. I was really impressed with this bike when I got it. Cyclocross Bikes: I have my most recent addition to the family the Focus Mares. Focus was my bike sponsor this last year, and I love riding my Focus. I approached Focus for a sponsorship because of their huge involvement in cyclocross that it seemed like the right fit. I’m really glad they were able to step up and help me out. The bike is super light, accelerates out of corners and handles really well. My other cyclocross bikes (because I have a tight connection to them) are my Rock Lobsters. Previously to riding my Focus bikes, I was on Rock Lobster, and those bikes are just plain FUN, plus you can’t knock a custom frame built for you. Once you have a custom bike it’s really hard to NOT get rid of them, so..my family of CX bikes is quite large. What do you feel deters women from getting involved with cycling? Especially mountain biking/cyclocross/off-road? I’m not really sure what deters women from cycling, I think it could be fear. You hear it a lot that women are afraid of riding on the road because they’re scared of the cars, but the idea of screaming downhill on a mountain bike seems scary too! Also time accessibility plus cost. It’s a lot cheaper and easier to go buy a pair of running shoes and try to be a runner than it is to find a bike that fits, get shoes, cycling clothes, and a helmet. I think it’s harder to get women involved off road because it can be very intimidating. Riding off-road requires handling and skill, which can add another fear factor as a new rider. I think if you have young ones (small children) it also becomes harder to get into cycling due to time, again it’s a lot easier to grab some runners and bring the kids in a stroller and go for a run than it would be to find a sitter and go for a ride! Industry wise I think more women IN the industry would help get more women on and into bikes. I think companies like Liv are leading the way for the industry. I love what they do. Locally, I believe if women can team up and help lift each other up and be encouraging and show women new to the sport how fun it is, that could really help to increase women in the sport. Also, I think all women clinics are very encouraging to new women riders. 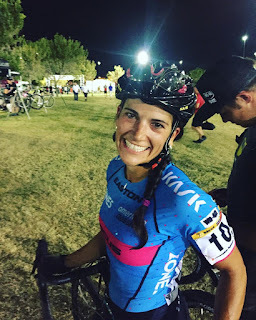 The past 2 years I’ve lead a women’s CX clinic where I live, and it’s been so much fun! With this type of environment it’s incredibly welcoming to new women and far less intimidating! I think the most inspirational thing is how positive, encouraging, and fun women are to ride with. 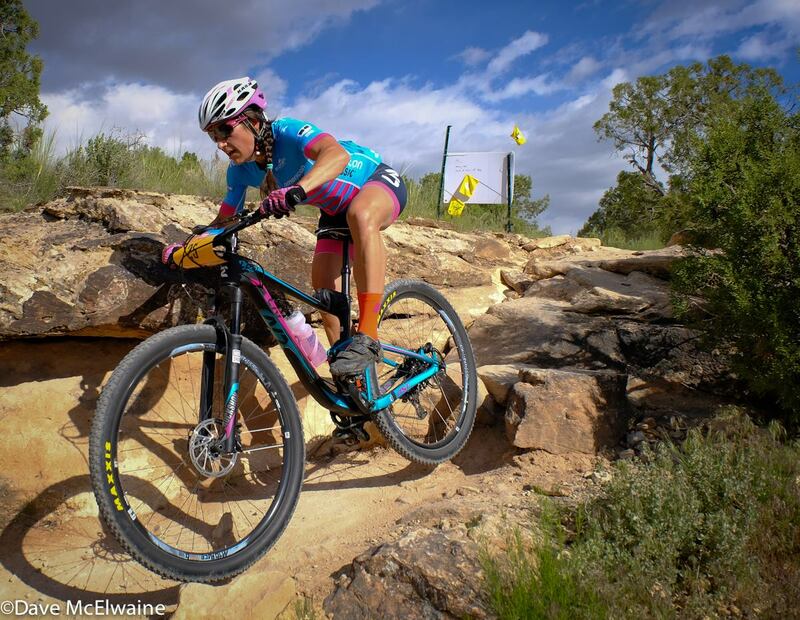 Mountain biking in particular, riding with other women pushes me to be a better rider and try things I might not otherwise try if I were riding with only males (or my husband). This aspect of riding makes it easy to encourage women to ride, letting them know that riding with women is FUN! I’m a large fan of playing Nintendo, particular the Mario games. ☺ I love Mario Kart on the Wii, but Super Mario Kart (on Super Nintendo) is my favorite. I literally grew up playing this game against my older brothers. I love pretty much any of the Mario games.